Practice Power Electronics questions and answers for interviews, campus placements, online tests, aptitude tests, quizzes and competitive exams. This set of Power Electronics Multiple Choice Questions & Answers (MCQs) focuses on “Current Source Inverters”. Explanation: In VSIs the input voltage is maintained at a constant value and the amplitude of the output voltage does not depend on the load conditions. However, the waveform of the load current as well as its magnitude depends upon the nature of the load impedance. Explanation: In CSIs, the amplitude of the output current is independent on the load impedance, as the input current (to the CSI) is kept constant. Explanation: In CSIs, the amplitude of the output current is independent on the load impedance, as the input current (to the CSI) is kept constant. However, the magnitude of output voltage and its waveform depends upon the nature of the load impedance. Explanation: In order that the current input to the CSI must remain ripple free an constant, L-filter is used before the CSI (in series with the energy source). Explanation: CSI converts the input dc current to an ac current at its output terminals. Explanation: Considering the SCRs as ideal voltage sources, when T1, T2 are on the load current is = I. When T3, T4 conduct, the load current is negative with respect to the previous value and = -I. Explanation: The load current waveform is a square wave with frequency = 1/T. As the load consists of a capacitor, dv/dt must be constant over every half cycle. This slope is positive from zero to T/2 and negative from T/2 to T.
Explanation: The line voltage is the difference of two phase voltages, the 3rd harmonic gets cancelled out, though it is present in the phase voltages. Explanation: All the CSIs need capacitors for their commutation if force commutation is required. Force commutation is essential for lagging power factors. Sanfoundry Global Education & Learning Series – Power Electronics. 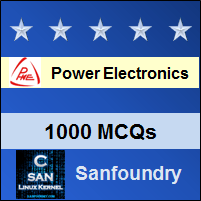 To practice all areas of Power Electronics, here is complete set of 1000+ Multiple Choice Questions and Answers.